Replicated Typo is doing a series of previews for this year’s EvoLang conference. If you’d like to add a preview of your own presentation, get in touch with Sean Roberts. At this year’s EvoLang Liz Irvine and I will be talking about how pointing can inhibit the emergence of symbolic communication. 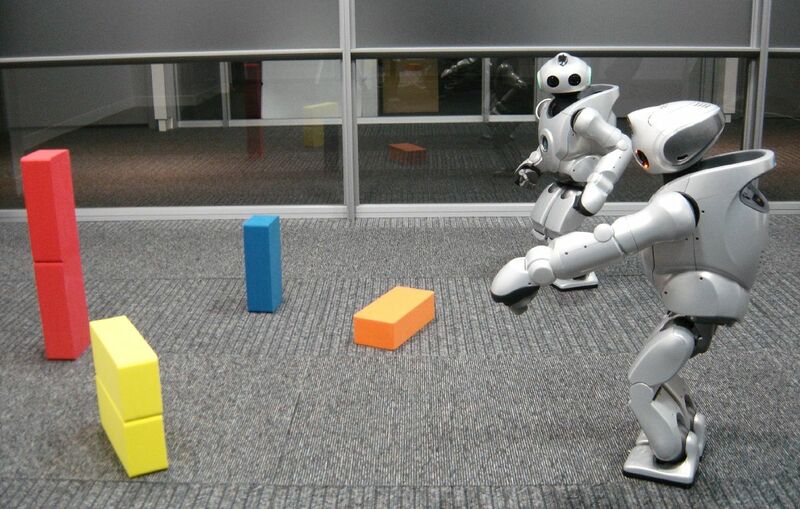 Robots use pointing to draw attention to objects in a naming game, see here. I point at the object I want. That is, if we’re good enough at pointing then we don’t need a symbolic language for this task. Of course, there must have been some task in our evolutionary history that provided a pressure for us to develop language. We set out to explore what kind of task this might have been by running an experiment in Minecraft. This simulates something like people having ‘specialisations’, e.g. one person knows about building wooden things and another knows about working stone. This meant that they needed to communicate about locations and colours of blocks, but they were not allowed to talk. Instead, they could only use their virtual avatar to ‘point’ at stuff by directing their gaze at something, then jumping up and down (we realise that this isn’t normal pointing, but it’s as close as we could get in Minecraft). 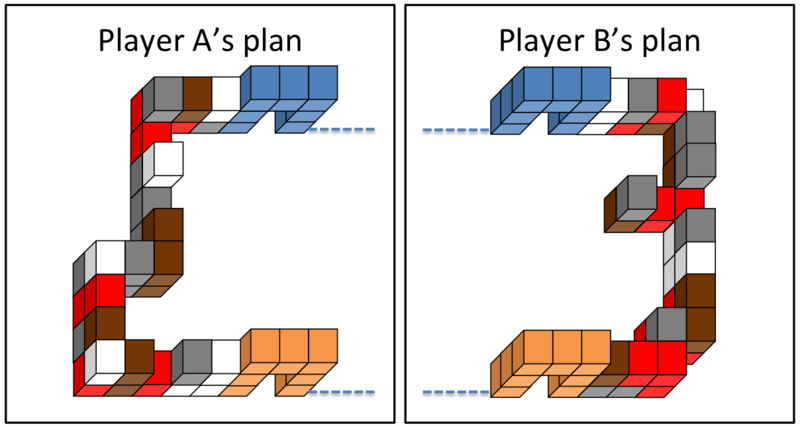 Below is a video of two people working together to place some blocks (the perspective from both players’ viewpoints are shown, but in the actual experiment they could only see their own perspective. Halfway through, player B realises a mistake has been made and removes some blocks before continuing). They’re able to cope pretty well without a symbolic language, just by using pointing and trial-and-error. In a second condition, we allowed another group of people an extra communication channel – knocking on the table. However, instead of developing a symbolic system, they used this mainly for attention-getting and signalling simple pragmatic things like ‘yes’ or ‘let’s move on’. Below is an example of this (the scrabbling sounds in the background are just the players’ mouse moving quite close to the microphone). 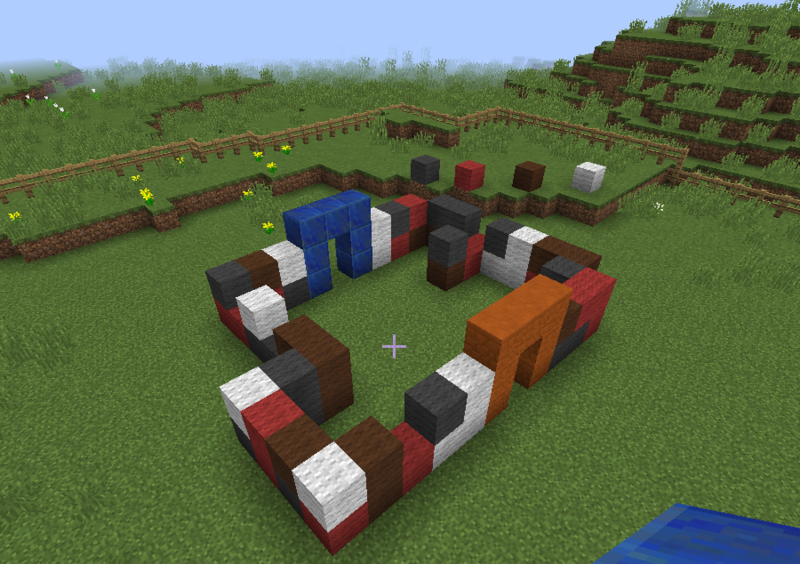 Note that one player uses some blocks as ‘referents’ to indicate what colour should be placed – a clever tactic that avoids the use of a symbolic system. We even saw the emergence of quite complicated interactions. In this one, there’s some confusion about which block should be placed where. They players have set up a series of ‘reference’ blocks to one side, and one player uses them to ask “you mean a white block?”, and the other player confirms by also tapping on the reference block. This is essentially a naming game sequence, with a request, a guess and some feedback, but it has emerged in a meaningful cooperative task. No participants came up with a symbolic way of referring to blocks. The pair who completed the task fastest didn’t even use the extra ‘knocking’ communication channel. From talking with the participants, we found that some had thought about setting up some kind of system, but didn’t want to spend the time doing it, since it would have taken too long and they could do the task just fine. Clearly, symbolic language does confer some advantages – I’m communicating with you right now in a way that would be much more difficult with pointing only. However, setting up a symbolic system takes time and effort. If the task demands are not enough to justify that effort, then symbolic signals are unlikely to emerge. In fact – we’ve found is that it’s actually pretty hard to think of an experimental scenario that’s somewhat ecologically valid where people would need to do this. We have some ideas about how this task could be tweaked so that symbols do emerge, and you can hear more about this at our EvoLang talk.